In Namibia in 2014, the ruling SWAPO party decided to adopt a 50-50 gender quota for its representatives in the National Assembly. This brought the representation of women in the National Assembly to 41% in the election that year (more than twice the current 19% of women in the U.S. House of Representatives). Recent survey results show that the move has proved highly popular in Namibia, with 71% of women and 68% of men saying that such a quota should be mandated for all political parties. Such detailed insights into public opinion are now available for over 30 African countries, due largely to the work of Afrobarometer, a continent-wide network which conducts professional surveys with local partners and is now reporting its results from its 7th round of surveys since 1999. Analyses of results from the November 2017 survey are now being released by the Institute for Public Policy Research in Windhoek, Namibia. Like Afrobarometer surveys in other countries, they provide a valuable antidote to over-generalization and stereotypes, whether nefarious or simply uninformed, about "Africans" or indeed "all" people in any country in Africa or anywhere in the world. I have often made reference to Afrobarometer surveys in AfricaFocus (see http://tinyurl.com/y9xrnscx for previous Bulletins making use of Afrobarometer). Today's Bulletin focuses on Namibia, both because it is a country that rarely features in international news other than for tourist travel, and because of notable findings such as on the leading role the country is taking on women's rights to political leadership. AfricaFocus readers may laugh at President Trump's invention of a country called "Nambia" last year (see coverage in Washington Post at http://tinyurl.com/yacr7lg6). But all of us non-Namibians can benefit from more nuanced understanding of Namibia. More generally, Afrobarometer deserves much wider attention from scholars, journalists, and anyone interested in substituting nuanced analysis for stereotypes. Increasingly global polling firms also include African countries, with surveys in local languages and sophisticated methodology. But Afrobarometer has pioneered in doing this. And, while commercial firms do not allow access to the public for closer analysis of the data, Afrobarometer provides a flexible and user-friendly on-line tool for doing so, while protecting individual privacy. At the end of this Bulletin I show a few tables and graphs generated with their on-line data analysis tool. In addition to gender, other topics addressed in the excerpts below include the negotiations with Germany for reparations for the early 20th century genocide of the Herero and Nama, and the state of Namibia's economy and democracy. The next presentation, on May 22 in Windhoek, will focus on service delivery in rural and urban areas. An additional reason for the focus on Namibia this week is work AfricaFocus is doing with the Making the Road travel seminars to Southern Africa and Cuba (http://makingtheroad.com), and in particular the group going to South Africa and Namibia this summer. In 2016 and 2017 I began working with my long-time friend and colleague Prexy Nesbitt to help out with some tasks, which have included preparing resource guides for participants, including links to recent articles, videos, and maps, to supplement their dialogues on the ground with social-justice activists and liberation movement veterans. Now we have decided to make these resource guides available to a wider audience on the web. They are designed not as academic resources or for specialists, but as aides in introducing background and issues relating to each country visited, highlighting recent and accessible information. Just published, in coordination with work on today's Bulletin, is a short resource guide on Namibia (https://tinyurl.com/MTR-Namibia). 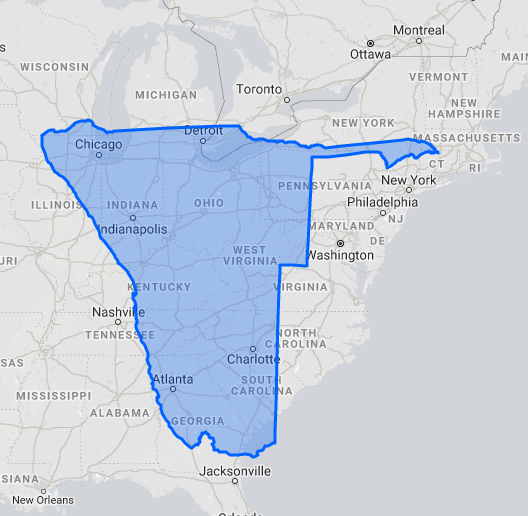 The comparative map to the right, generated through http://thetruesize.com, available in larger size in the resource guide, illustrates the relative size of Namibia and the United States. Another short resource prepared for Making the Road, on Southern Africa: Many Countries, Intersecting Histories, includes several similar maps and short background text explaining how "Southern Africa" is more than "South Africa." The Afrobarometer team in Namibia, led by the Institute for Public Policy Research and Survey Warehouse, interviewed 1,200 adult Namibians in November 2017. A sample of this size yields country-level results with a margin of error of +/-3% at a 95% confidence level. Previous surveys have been conducted in Namibia in 1999, 2002, 2003, 2006, 2008, 2012, and 2014. Taxes and budget: Almost three-quarters of citizens endorse the legitimacy of tax officials, even though more than two-thirds say at least "some" tax officials are corrupt. A pan-African, non-partisan survey research project that measures citizen attitudes on democracy and governance, the economy, civil society, and other topics. Started in 12 African countries in 1999, expanded to 36 countries in Round 6 (2014/2015). Round 7 surveys are being conducted in 2017/18. Goal: To give the public a voice in policymaking by providing high- quality public opinion data to policymakers, policy advocates, civil society organizations, academics, news media, donors and investors, and ordinary Africans. A national partner in each country conducts the survey. In Namibia, Afrobarometer Round 7 survey was conducted by Survey Warehouse and the Institute for Public Policy Research. * All respondents are randomly selected. * Sample is distributed across regions/states/provinces and urban/rural areas in proportion to their share in the national population. * Every adult citizen has an equal chance of being selected. Face-to-face interviews in language of the respondent's choice. Standard questionnaire allows comparisons across countries and over time. Sample size in Namibia of 1,200 adult citizens yields a margin of error of +/-3% at a 95% confidence level. Fieldwork for Round 7 in Namibia was conducted 5-27 November 2017. More than half of Namibians (59%) say that the increased number of women in the National Assembly has made Parliament more effective. Moreover, seven in 10 Namibians (70%) say that all political parties should be mandated to adopt a gender quota in the National Assembly. Although men and women differ on whether men make better leaders than women, on the whole, most Namibians (68%) believe that women should have the same chance of being elected to political office as men. A majority of Namibians (84%) say it is never justified for a man to beat his wife. Most Namibians (71%) say alcohol abuse is the predominant factor that contributes to GBV in the country. Despite daily reports of GBV in Namibia, most Namibians (71%) believe that the government is handling the fight against GBV well. More than half of Namibians (56%) say traditional authorities should join genocide negotiations. However, only 48% say government is doing well on these negotiations. Two-thirds (66%) of Namibians say Germany should pay reparations. Almost three-quarters (73%) of Namibians say tax officials always have the right to make people pay taxes, even though more than two-thirds (69%) believe that at least "some" tax officials are corrupt. About two-thirds (64%) of Namibians say that government should reduce the defense budget. A slim majority (53%) believe government should raise taxes to fund povertyreduction efforts. A little more than half (52%) of Namibians say that government is not effective in providing serviced land/housing in urban areas. A majority (56%) are of the opinion that the government's land resettlement program is not effective. AR is perceived as most effective in getting government to pay attention to land issues and also represents the most widely supported approach to land reform. Who gets government to pay attention to land issues? More than half of Namibians think that the increased number of women in the National Assembly has made Parliament more effective, according to the most recent Afrobarometer survey. Moreover, more than two-thirds of Namibians support the use of gender quotas to ensure more equal participation of men and women in both National Assembly and regional council elections. In 2015, Namibia leapfrogged many countries to become a global leader in the representation of women in the National Assembly after the ruling SWAPO party implemented a 50/50 party list. However, regional councils and the National Council continue to be dominated by men. With the next set of elections taking place in 2019 and 2020, and given the government's stated commitment to gender equality, gauging public support for quota systems, as well as perceptions of the impact on the National Assembly of the increased number of women, is timely. A majority (59%) of Namibians say that having more women in the National Assembly has made that body more effective (Figure 1). More than two-thirds (70%) of Namibians, regardless of gender, say that all political parties should be mandated to adopt a gender quota to ensure 50/50 representation of men and women in the National Assembly (Figure 2). The same majority (70%) say the gender quota system should be extended to the regional councils (Figure 3). Most Namibians (68%) believe that women should have the same chance as men of being elected to political office (Figure 4). Respondents were asked: Which of the following statements is closest to your view? Statement 1: Men make better political leaders than women, and should be elected rather than women. Statement 2: Women should have the same chance of being elected to political office as men. (% who "agree" or "agree very strongly" with each statement). Most Namibians say traditional authority representatives should participate in - if not lead - genocide negotiations with the German government, according to a new Afrobarometer survey. Only one in five citizens say the Namibian government should handle the negotiations on its own. A majority (56%) of Namibians say genocide reparations negotiations should be handled by both government and traditional authorities. An addition 11% say Herero and Nama traditional authorities should conduct the negotiations themselves (Figure 1). Almost half of Namibians (48%) think government is handling reparations negotiations with the German government "very well" or "fairly well" (Figure 2). 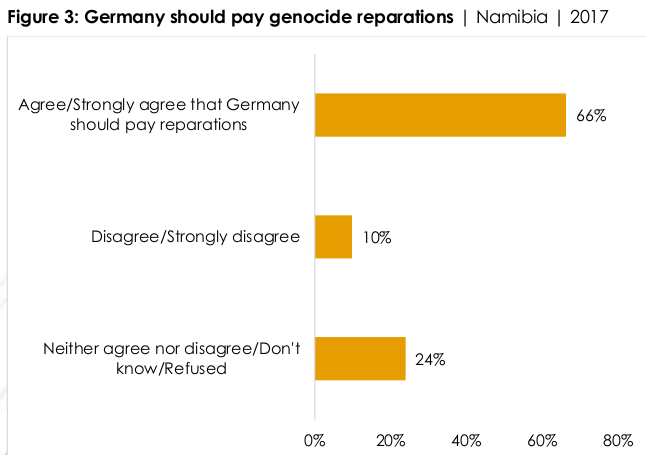 Two-thirds (66%) of Namibians say Germany should pay reparations for the genocide; only one in 10 Namibians (10%) disagree (Figure 3). Respondents were asked: For each of the following statements, please tell me whether you disagree or agree: The German government should pay reparations to Namibia for the crimes of genocide committed against the Namibian people? In the past two years, Namibia's economy has struggled. In 2016, the country saw two consecutive quarters of negative gross domestic product (GDP) growth, officially plunging it into a depression, followed by the first year since 1993 to record a decline in the GDP, by 0.8% in 2017 (Namibia Statistics Agency, 2018). At the same time, unemployment among youth, who make up almost 40% of the population, increased to 43.4% in 2016, up from 39.2% in 2014 (Namibia Statistics Agency, 2015, 2017). Citizens' perceptions tell a similar story: According to the most recent Afrobarometer survey, the share of Namibians who think the economy is doing poorly is at a historic high, triple the proportion in 2014, and almost two-thirds say the government is doing a bad job of managing the economy. Yet more than half describe their personal living conditions as good, and a majority expect things to get better over the coming year. Even though youth tend to rate their own living conditions more favourably than their older counterparts, they are particularly critical of the government's economic management. They are also more likely than their elders to be thinking about moving to another country. Economic considerations feature heavily in these thoughts: By far the most common reason for considering emigration is to find work. The share of Namibians who rate the country's economic condition as "fairly good" or "very good" has dropped from 74% in 2014 to 41%. About half (52%) of Namibians describe their personal living conditions as "fairly good" or "very good." Youth are somewhat more likely than their elders to see their living conditions as good (55% vs. 48%), but they are less likely to approve of the government's performance on the economy (31% vs. 40%). One in five Namibians (22%) have given at least "a little" thought to emigrating. Youth are more likely than their elders to think about moving to another country (27% vs. 17%). Namibians' reasons for considering emigration are predominantly tied to economic issues. Since the second round of the Afrobarometer survey in Namibia in 2003, respondents have been asked how they would describe "the present economic condition of this country." In the preceding five rounds, Namibians who thought the state of the economy was "fairly good" or "very good" always far outnumbered those who considered it "fairly bad" or "very bad." As of November 2017, however, negative assessments of the economy stand at a record high, tied at 41% with positive evaluations (Figure 1). Compared to the 2014 survey, the proportion of citizens who describe the economy as "fairly bad" or "very bad" has almost tripled, while the share who say it is fairly/very good has dropped by 33 percentage points. This pattern holds across key demographic groups, with little difference by gender, age, area of residence, or educational level (Figure 2). 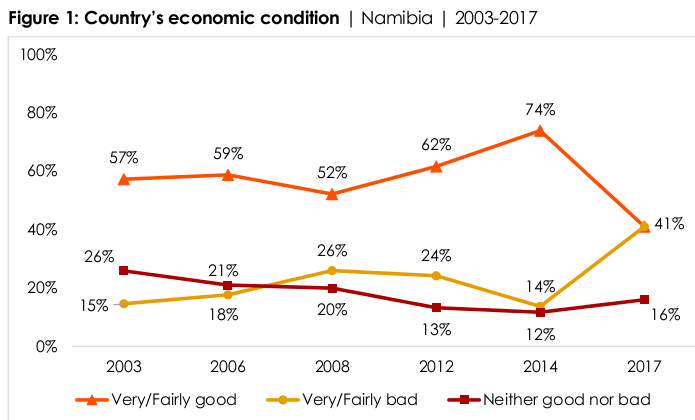 A slight majority (52%) of Namibians consider their own living conditions "fairly good" or "very good" - a decrease from 60% in the 2014 survey (Figure 3). The share of Namibians who rate their living conditions as "fairly bad" or "very bad" has increased by 10 percentage points since the previous survey. Respondents were asked: In general, how would you describe the present economic condition of this country? Respondents were asked: In general, how would you describe your own present living conditions? For anyone interested in getting behind the headlines to understand recent developments in African countries in the 21st century, Afrobarometer is an indispensable source. Surveys are only one window into reality, of course, but they provide rich data that both help unpack stereotypes and provoke questions needing indepth exploration through other sources as well. For readers to make their own judgments, Afrobarometer provides full questionnaires and explanations of survey methodology for each country included over the seven rounds of surveys since 1999. The results sampled above from Namibia are from the most recent survey round from 2016/2018. The data from Namibia for that round is not yet available in the Online Data Analysis tool (http://afrobarometer.org/online-data-analysis/), which now has the latest data from 8 of the more 36 countries available from the previous round in 2014/2015. The tool is extremely flexible and not difficult to use, although it includes many option for creating tables and charts and for downloading raw data as well as results in different formats. Here are a few of the charts and tables I created from the Round 6 Namibia data, with one from South Africa for comparison. Note that these are not from the current Round 7 results reported above. This breakdown by race shows that a majority of Namibians of all races were confident of the general direction the country was going, with close to 80% of both black and white Namibians giving positive ratings. 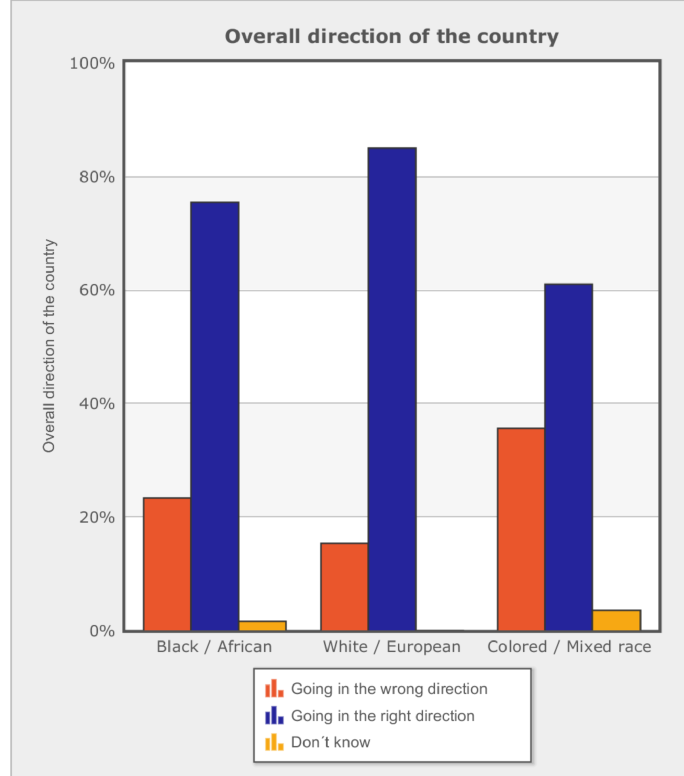 The combined totals for satisfaction with democracy ("fairly satisfied" or "very satisfied" also came to 60% or over in all racial groups in Namibia. 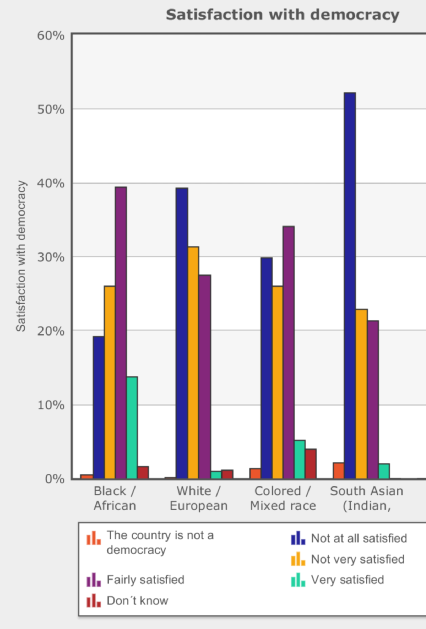 This contrasted with public opinion ratings of satisfaction with democracy in neighboring South Africa (chart below), which were both lower and showed significant variation by racial groups. The snippets of data above are, of course, only teasers. But they show the potential richness of data available on-line, for more in-depth analyses by scholars knowledgeable about Namibia or for exploration by teachers, students, journalists, policy makers, or other analysts.